Source: Received as seed from a seedling budline grown from fruit produced in the Rubidoux quarantine screenhouse on trees grown from budwood received from Glen Dale, 1961. Parentage/origins: Parents unknown. Open pollinated seedling. EMN, 2/8/1988: This is a typical seedy sweet orange of medium-early maturity; tastes sweeter now than most sweets.
" Fruit medium to medium-large, subglobose to round; basal cavity small and deeply furrowed; apex flattened or slightly depressed; seedy. 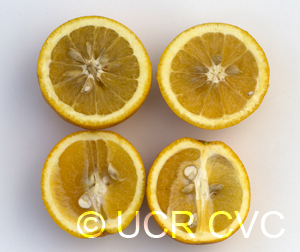 Color yellowish-orange at maturity. Rind medium-thick and surface finely to moderately pebbled. Flesh very juicy and flavor pleasant when fully mature. Medium early in maturity, but holds well on tree and ships well. Tree vigorous, hardy, large, and productive. One of the oldest Italian varieties and of unknown origin, Biondo Comune has been little planted in recent decades and doubtless will ultimately disappear. 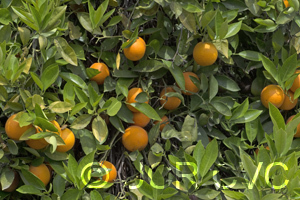 It still comprises the bulk of production of common sweet oranges in some of the oldest Italian districts. "